I have known Pilar for many years and it is always a pleasure to visit her in her beautiful home. 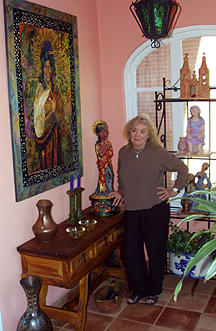 She lives life as full, colorful and vibrant as the many paintings she has done over the years, many of which adorn her bright home. Pilar is from Mallorca, Spain, and creates in her everyday life, her artistic works, and even her charming conversation, an intoxicating blend of the Mediterranean and the Rocky Mountain West. Personally, I don’t get too enthused about how the scholars and reviewers interpret an artist’s work. That has never worked for me, so I won’t take that approach. For this article, I have included just a small, representative portion of the conversation I had with Pilar. Through her descriptive responses, it was a delight to learn first-hand from this talented artist how she found her way to painting and what inspires her. Shawn: Your resume answers one of my questions, and that is, you are self taught? Pilar: Yes, and I am sort of proud of it. Shawn: Well, you should be. Your work is wonderful, it is very successful. Pilar: When I started, I was older. I had always wanted to be an artist, as I think I have probably told you, but in Spain I didn’t have a chance. My family, they were very conservative and my mother didn’t want her daughters to do anything. So, when I came here and I had children I thought the opportunity was long gone. Then all of a sudden I started doing sculptures. My son, who was fifteen, wanted to have a class in photography at the Art Barn. My husband said, “ Why don’t you take a class in something so you don’t have be driving him back and forth?” I said okay and I took a pottery class. I always had to wait for the wheel and while I was waiting I started forming things with the clay, and I decided that is what I wanted to do. So, I bought clay and I started working on this kitchen table on my own. I never did pots. That is how I started. And then I decided to start painting. . . . I decided that I was going to do it on my own and make my own mistakes and everything. That is how I did it. That’s why I am self taught. But, I got a lot of books. All my life I have seen art, I have gone to art museums, and everything, so I think I had a lot of good knowledge of art. I think that technique is something you can learn with books. What you can not learn is the inspiration, an idea of what you want to do. It is you or it isn’t. Shawn: Your work is certainly full of inspiration and ideas. That is one of the things I wanted to ask you about. What do you prefer to draw from for your source of inspiration? There are many themes from Mallorca. Often I have a mirror and I look at the ways I put a hand, I draw my own hands. Or sitting in front of another mirror, I look at myself when I am sitting in certain positions. Or sometimes I will see in the newspaper some pose that strikes me like something I would like to do and I use that. I never paint straight from a photograph. If I use a photograph it will be some photograph that is not very good, that is blurry or something. I don’t like to use photographs that are really wonderful, because I will be doing what the photographer has already done. So, in general, I like things that are not very good, but that inspire me somehow, then I can do what I want. Shawn: Tell me about your use of color. Color is paramount in your work. It’s pervasive. It’s important. It’s strong. Pilar: I think with color you can express very much. You can express all kind of different moods. But, I also think that color is kind of, to me, a progression. For instance, sometimes I will start something and I don’t know which colors I am going to use at that moment. I think about what I am going to do and then I think of the first color that I think I want to use there. I start with a color that really expresses something for that subject to me. And then, immediately that color brings me another. And it is one color bringing the other. I like surprising things. . . . Some people ask me “How come you have used these two colors that are absolutely wrong to use together? But they look good.” And so I said, “Who said they were wrong to use together? Why do you have to have a rule?” I think that the reason that I have not studied with anybody, and I am a self taught artist, that tells me that I don’t have to follow any rules, but what I think and what I feel. I think that is what makes my colors perhaps a little different than other people. I don’t know, because I don’t think much about what other people will do. Also, I see a lot of color. For instance, I think even in the last few weeks I have seen brighter colors than I have ever seen. I don’t know why it is. Is this spring more colorful than others? With this final thought, Pilar sums up the attitude that typifies the brilliant, colorful way she views and interprets the world. 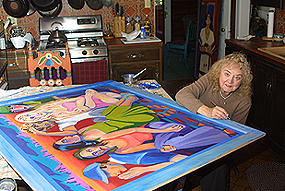 Every spring Pilar has an open house and invites several other artists to display their work. This is a “must attend” event for any avid art collector or simply for the individual who enjoys musing upon the work of talented artists in a beautiful setting. This year the “Art in Pilar’s Garden” will feature seven artists and be held from 5:00pm to 9:00pm on June 7, 8, and 9th, 403 East 8th Avenue. While attending this delightful event several years ago, I was very inspired and I made many notes. These notes became the basis for a very descriptive poem, respectfully colorful in its own right, of Pilar, her creative work, her parties, her home and life. Click here to read the poem, entitled The Spanish Woman. I will be attending her art in the garden presentation again this spring and look forward to the opportunity of meeting some our 15-Bytes readers and artists there.